Your dentist is probably always telling you to floss. Out of all the readers here, I’m willing to bet that only 5% of you actually floss. It’s ok, no one does it. 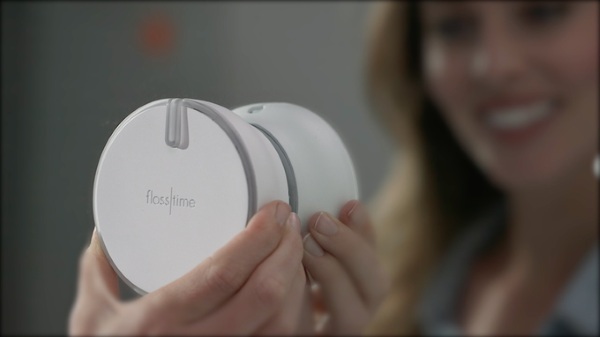 Flosstime is a smart dispenser that wants to make the most ignored dental health advice a daily habit. You stick this little gadget to your bathroom mirror so it’s always in your face. Unlike normal floss dispensers that hide in your medicine cabinet, this one will be a bit harder to forget. All you need to do is tap it and it will dispense 18 inches of floss. Then a timer will start that will run for 90 seconds so you know you’ve flossed long enough. It wants to help you build the habit so when you finish it smiles at you but if you forget your daily flossing, it displays a red frown because it’s disappointed in you. Do you want to make your bathroom gadgets unhappy? If you want to be met with smiles (not to mention keeping your own looking good) then you’ll floss! The Flosstime is currently raising money through Kickstarter and can be snatched up for $20.